Katie Nolles, Bassett, Neb., was crowned the 2014-15 National Hereford Queen during the 2014 American Royal National Hereford Show in Kansas City Nov. 2. A fifth generation Hereford breeder, Katie will spend the next year in her new role as the face of the Hereford breed and an agriculture advocate setting a positive example for young women. "I will never forget being a little girl who researched the National Queen program and closely monitored the woman in white," Katie says. "What an impact she made on my life. I plan to uphold the excitement that young ladies have by investing personally in each one whom I interact with and always showing that I am excited to be wherever this journey may take me." Katie competed against nine other young women from across the U.S. for the title. The National Hereford Queen program is managed by the National Hereford Women. 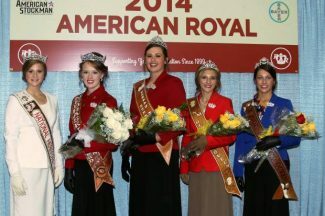 Queen candidates are evaluated on their involvement with and knowledge of the Hereford breed, behavior, attitude, appearance and interaction with producers, as well as their résumés and interviews. Judges look for a responsible, well-rounded young lady who is willing to spend an entire year traveling all over the country to represent the Hereford breed to her best ability. First runner-up honors went to Bailey McKay, Marysville, Kan.; Jordan Spindle, Moriarty, N.M., was named second runner-up; and Kagney Collins, Flanagan, Ill., was selected as Miss Congeniality. Katie is the 17-year-old daughter of Mike and Trudy Nolles, who live on a Hereford ranch in the Nebraska Sandhills. At the age of 10, Katie committed to becoming a leader in the Hereford breed and has since attended seven Junior National Hereford Expos (JNHEs) and two Program for Reaching Individuals Determined to Excel (PRIDE) Conventions. She has participated in numerous contests at the JNHE and was a member of the 2012 champion senior team marketing and the 2014 champion Hereford bowl teams. She has also placed first in illustrated speech in both the junior and intermediate age divisions. Katie is a member of the Nebraska Junior Hereford Association and is currently in her second term on its board of directors. She is very involved in 4-H and FFA and has held offices in both organizations in addition to participating in contests on the local, state and national level. Katie is a senior at Rock County High School and plans to attend the University of Nebraska-Lincoln to major in animal science and agriculture education and minor in leadership and entrepreneurship. Hereford cattle remain in Katie's future as she intends to return to her family ranch to raise registered Herefords, teach agriculture and one day have a career as a leadership coach for an agriculture based company.